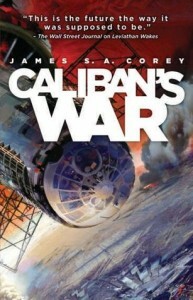 I thought Leviathan Wakes, the first book in the Expanse series, was a very entertaining Space Opera and the first sequel, Caliban’s War, is a good follow-up even if it probably falls slightly short of the first novel. Although Leviathan Wakes would have worked fairly well as a stand-alone novel it did leave a major issue unresolved in terms of the protomolecule colonising Venus. Perhaps surprisingly this part of the plot is largely kept in the background in this book (presumably the later books in the series will explore this in more detail), with the main plotline focusing on the attempts of corporations and governments to explore the military potential of the alien biology of the protomolecule. The book opens with an attention-grabbing action sequence as a base on Ganymede is attacked by a monstrous figure with near-superhuman abilities. As the colony on the moon descends into chaos a scientist desperately searches for his missing infant daughter and his quest to rescue her is the main plotline for the book. The scientist, Prax, makes up one of the three new point-of-view characters in the book along with Martian marine Bobbie (the only survivor of the attack in the prologue) and scheming politician Avarsala, joining the returning Captain Holden who, after a chance meeting, ends up helping Prax try to find out what happened to his daughter. I thought that the cynical detective Miller was the best character in the first book and his absence does hurt the second book. Out of the three characters replacing Miller’s chapters I think only Avarsala is as interesting as Miller was, while Prax and Bobbie are both likeable characters they are both fairly straightforward characters without the ambiguous mix of idealism and ruthless pragmatism that makes Miller and Avarsala such interesting characters. Holden is also a likeable character, but his naivety feels a bit overdone at times and it does feel slightly implausible that he yet again manages to stumble into the middle of a huge corporate conspiracy. The book is probably at its best in the action scenes, an unexpected stowaway on Holden’s ship might be the highlight but the climactic battle is also entertaining. The theme of corporate and government greed leading to inhuman acts in the pursuit of profit and military dominance is repeated from the first novel and although the largely faceless corporations make plausible villains there is a lack of a really memorable antagonist. Holden’s decision to help one man look for his daughter while an entire colony falls apart is believable in terms of his character, although it does occasionally feel a bit like the crew of the Rocinante are turning into a Space Opera version of the A-Team, which may be fun to read but it does feel like the book could have aspired to be more than that. This is an entertaining read but it does largely feel as if it is marking time before the main plot about the protomolecule on Venus comes to the fore again in the sequels (the epilogue strongly implies that this plotline will become the focus of the next book). It’s an enjoyable space opera but to some extent feels like a partial retread of some of the material covered by the first book in the series.